Maple Moon Winery Petoskey review and tours winery info. Winery, syrups, maple goods, gifts, ice cream and more located off Atkins Rd just East of Downtown Petoskey, Michigan. 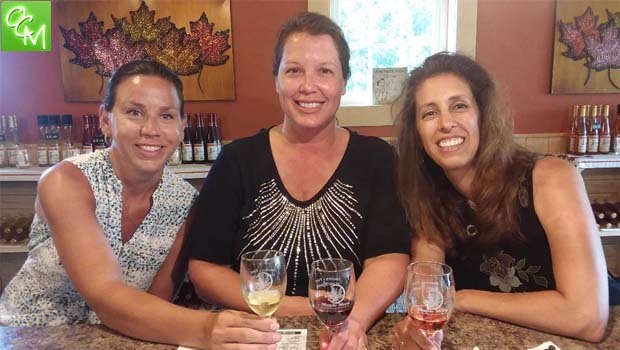 If you enjoy wine, up north Michigan, and a good view, Maple Moon winery should be on your list of winery tours. Maple Moon Winery Petoskey is a family owned business located within an 80-acre forest in scenic Petoskey, up north Michigan. Maple Moon winery has approximately 5,000 taps and produces an average of 1,500 gallons of syrup. With this delicious ingredient, they have a full store filled with many goods for sale…maple syrup, bourbon barrel aged maple syrup, maple sugar, maple cream, maple root beer, gift baskets and other items like jam, salsa, honey, mustards, sauces, the award-winning Moomers Ice Cream…AND Maple Wine! (blueberry, blackberry, peach, cherry…) and the fruit flavor is very pronounced, in a good way. The “hint” of cherry is apparent enough to enjoy the taste, yet is blended well with the other ingredients. Maple Moon winery also offers hard cider, as well as a bourbon wine that packs a punch with 18% alcohol. All the wines are so unique, a wine-tasting at Maple Moon winery is a memorable experience. Wine tasting at Maple Moon winery Petoskey allows guests to enjoy a flight of five samples and you get to keep a glass. After trying five of the wines, I honestly could not pick a favorite. They were all impressively good. The staff was super kind and chatted with us during the tasting, telling us more about their story and unique wines. We’ll definitely be going back on our next trip as we would love to experience the great views, wines, and maple products again. Maple Moon winery holds an annual anniversary celebration every February, a “Wineshoeing” (snowshoeing plus wine) event in honor of the launch of both the syrup business and the wine business. Guests get a tour of the 80-acre forest via snow shoes (which are available for borrowing), plus wine and chili. You can order Maple Moon winery products to be packaged and shipped within the USA. Wine is not available for shipping. Orders can be placed online or by calling 231-487-9058. See REVIEWS / TRAVEL for more Indian River, Petoskey, Harbor Springs, Pellston Michigan travel reviews and pics.